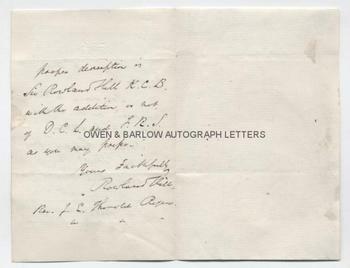 SIR ROWLAND HILL Autograph Letter Signed. British (English) postal reformer. The introducer of "the penny post" and credited with the invention of the postage stamp. ALS. 2pp and integral blank leaf. Hampstead, N.W. 5th April 1869. To the economist, Rev J.E. Thorold Rogers. Together with a contemporary carte de visite portrait photograph. "I am sorry to trouble you again on the subject of Adam Smith's statue. I observe that you designate me "Bart." This is an error which should not find its way into the list of subscribers should any be published. My proper description is Sir Rowland Hill K.C.B. with the addition, or not, of D.C.L. and F.R.S. as you may prefer". 12mo. Approx 5.25 x 3.5 inches. Mounting residue to verso of integral blank leaf but the text leaf is in fine condition. The portrait of Sir Rowland Hill is a 19th century (circa 1865) albumen carte de visite photograph by the Stereoscopic Company. 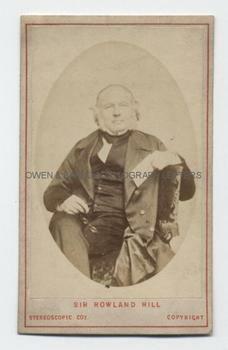 It shows Sir Rowland Hill half-length, seated. It is in fine condition. Sir Rowland Hill was also an educational reformer and a campaigner for better conditions for the poor, but he will always be known as the man who revolutionised the postal service and introduced the postage stamp. James Edwin Thorold Rogers (1823-1890), known as Thorold Rogers, was an economist, historian and Liberal politician. 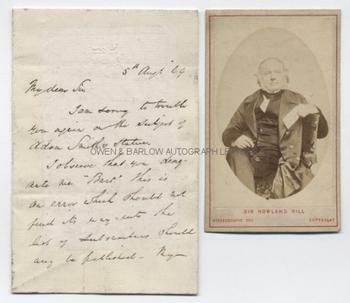 Sir Rowland Hill addresses him in this letter as "Rev[erend]" but Rogers was able to withdraw from his clerical vows in the following year (1870), as a result of the Clerical Disabilities Relief Act, which he, himself, had been instrumental in passing and of which he was the first beneficiary. The statue of Adam Smith is presumably the one that was sculpted by Hans Gasser in 1869. It is currently housed at Randolph Hall in the University of Glasgow but no-one quite seems to know how it got there. It was thought that there was another identical or similar statue held at Oxford University but there is now no trace of it and it may be that these are one and the same. 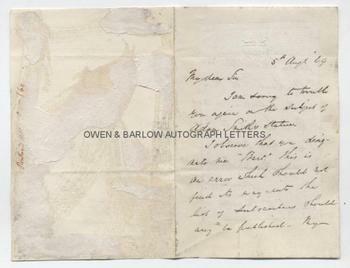 Rogers was a Fellow of All Souls, Oxford at this time and it appears from this letter that he had been involved in raising a subscription for the statue, of which Sir Rowland Hill was a contributor.